Have you been thinking about getting an electric hoverboard? If you have, then the time to get one is definitely now! The prices have come way down, and there are plenty of great brands available depending on your individual needs. If a hoverboard is something you think you could use, you’re in luck. This article is about the best electric hoverboards available for sale on the internet today. After hours of exhaustive research, I have narrowed the field down to five of the top performing hoverboards based on features and price. This 15004-Red Hoverboard from PowerOnBoard used to be priced at a thousand dollars, but now it’s affordable so anyone can buy one. We’ve all heard about the hoverboards that pose a safety risk because they overheat. This hoverboard won’t get hot on you, smoke, spark, or burst into flame, because it meets the U.S. Government’s strict UL 2722 certification. 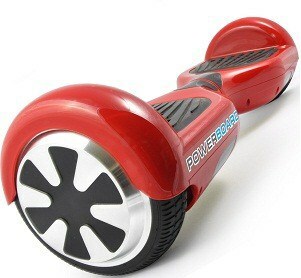 When you buy the Powerboard, you get a safe hoverboard without any worries. 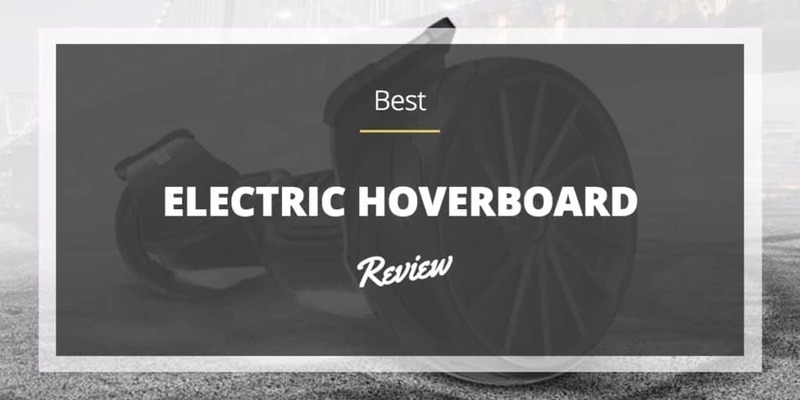 The Powerboard hoverboard makes it reputation by being better built and performing better than the competition. It has a top speed of 10 kilometers per hour, which is 6.2 miles per hour in America. It has smooth acceleration so you won’t lose your balance, and steering is simple so you can drift corners like a pro. The Powerboard has the best power, acceleration, and top speed you can get. Hoverboards haven’t been around very long, so you might experience some quality or performance issues. 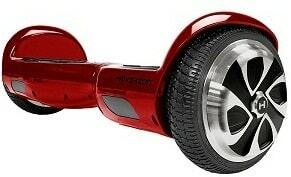 If you have problems with this ﻿1﻿5004-red﻿ hoverboard, rest assured that you’re going to be taken care of. PowerOnBoard is a company that’s based in the U.S.A., so not only will you get your hoverboard quickly, you’ll receive excellent customer service to go along with the solid one year warranty. The Hovertrax 2.0 is brought to us by Razor, an industry leader in the scooter industry. Razor engineers made sure you get plenty of power with this hoverboard. They installed two 350-watt electric motors that operate silently and deliver plenty of performance. The top speed of this hoverboard has been clocked at over 8 miles per hour, which should be plenty fast for almost everybody. Power is provided by some advanced battery technology on the Razor hovertrax 2.0 hoverboard. The lithium ion battery pack is rated at 36 volts, which is a bunch of power that will last for a long time. The pack is easy to change out, and a full charge will give a 220 pound rider up to an hour of continuous ride time, which is excellent. For nonstop action, make sure you get two battery packs. 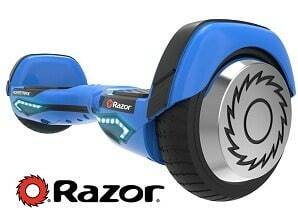 The Razor hoverboard has several advanced features that make it an excellent value when compared to others. It has an LED light bar to illuminate your path when you’re cruising at night or in dark areas, rubber bumper fenders to cut back on scratches and damage to the chassis and fenders, and an LED battery power level indicator, so you can see when you’re about to run out of battery power. There are also two riding modes to help you learn how to ride: Normal and Training mode. The S hoverboard from HOVERZON is a hoverboard that’s built for high performance. As with any electric powered vehicle, the limiting factor is usually the range, or how far it can go. With the S hoverboard, you can travel up to 11 miles without the need to recharge, so depending on your commute, you could possibly ride this hoverboard to work! Just bring your charger and it will be ready to take you home at the end of the day. The long range of this hoverboard is the feature that makes it stand out. As a performance hoverboard, the manufacturer tried to keep the overall weight of the unit down. It weighs in at 22 pounds, which is significantly lighter than most other hoverboards and makes it nicer to pack around when you can’t ride it. Despite the light weight of this hoverboard, it still boasts an impressive payload capacity of up to 220 pound riders, so almost everybody can ride. You don’t have to be pigeonholed into a color you don’t like with the S hoverboard. It’s available in six different colors so you can choose your favorite. Choose from Black, Blue, Red, Yellow, Pink, or White. 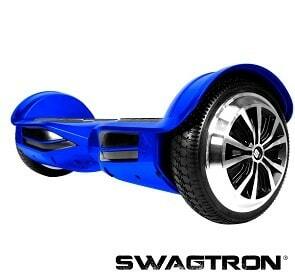 Do you want a hoverboard that’s equipped for more than just sidewalks? Then the EPIKGO is the one for you. The first thing you notice on this hoverboard is the wheels and tires. It has large 8.5 Inch alloy wheels that are fitted with some rubber tires with some aggressive traction. The large wheel diameter and soft tires make this an all-terrain hoverboard. The website claims that this hoverboard will take you through mud and sand, but it’s probably only good for some light dirt and fine gravel. That’s still better than the rest of the industry. This is the best hoverboard you can get for all-terrain use. 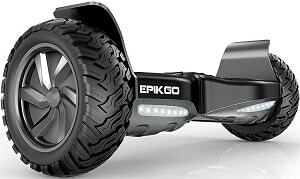 EPIKGO wasn’t satisfies making their hoverboard bigger and giving it off-road capability. They knew that if you want to ride off-road, you’re probably going to need more power. That’s why they gave this hoverboard the most powerful motors you can get. Dual 400 watt motors give this hoverboard the energy to climb slopes up to 18 degrees, plus it can achieve speeds over 10 miles per hour and maintain top speed for over sixty minutes. Massive performance and two hour fast charging technology make this the most versatile hoverboard you can buy. EPIKGO is a company that’s based in the heart of Silicon Valley right here in the U.S.A. They take pride in manufacturing the best quality hoverboard you can buy today. This product includes a one year limited warranty that covers both parts and labor, plus the customer service is U.S. based, which can be much easier to deal with. You can buy the EPIKGO hoverboard and know that an American company stands behind it. The T3 hoverboard from Swagtron boasts a unique feature that music lovers will enjoy. Yes, you read that right. This hoverboard has built in speakers that you can link to your phone via Bluetooth and the included app to stream all of your favorite music while you ride. Finally, there’s a hoverboard that acts as both a mode of transportation and a wireless speaker so you don’t need both. The Swagtron T3 is a truly unique board. The Swagtron hoverboard is UL 2272 certified, plus their SentryShield smart battery management system gives you more layers of electrical protection. You don’t have to worry about any fires happening with this hoverboard, so just ride and enjoy. 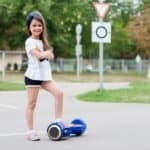 Some of the additional features you get with the Swagtron hoverboard are two riding modes, a five level battery indicator, LED headlights so you can see in the dark, and a handy carrying strap to help you pack it around. This is definitely a full-featured hoverboard that has everything you could ever want. Does not work with riders under 65 lbs. If you’ve been thinking about getting a hoverboard, then 2017 is a great year to do it. All of the safety issues concerning fires have been put to rest, and prices are much more affordable. If you’ve been trying to decide on which hoverboard is the right one for you, all five of the products listed above are great choices. However, I like to choose a winner after I do extensive research on a product. For the Best Electric Hoverboard 2017, my personal champion is the EPIKGO Self Balancing Scooter Hover Self-Balance Board. 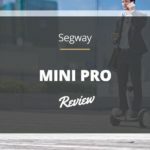 It has superior safety features and testing, the company is U.S.-based, and the large size and all-terrain wheels make it the most versatile hoverboard you can buy. It also has the most powerful motors and quickest charge time, so you can spend more time riding at a higher rate of speed. The price is very comparable to the other hoverboards, so it’s the best value of the bunch. Good luck with your hoverboard selection.